Welcome to the A.A.M.U.C. online store! 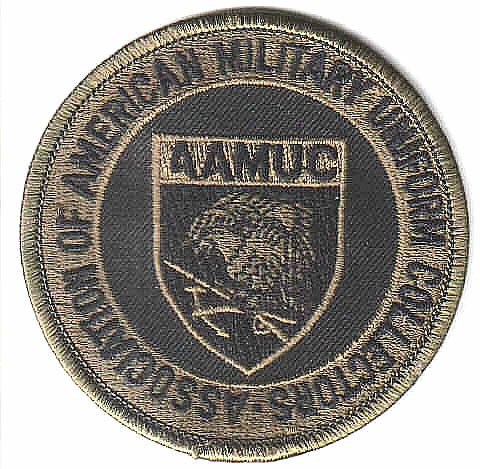 Purchasing from the A.A.M.U.C. online store does one of two things. First of all, you will get an item (delivered direct to your door) that you can proudly wear to show your support of not only A.A.M.U.C. but also to let others know that you proudly preserve military history by collecting. In addition, the proceeds of each item you purchase go to help support A.A.M.U.C. That way A.A.M.U.C. will continue to go strong for years to come! So, please take time to browse our offerings. And, if you see something you like, we would greatly appreciate your patronage..
To order an item, please enter the quantity of the item that you wish to purchase. Then click the ADD TO SHOPPING CART button. That button will transport you to a detailed view of your current shopping cart. From that screen you can either select to checkout, empty shopping cart, update your cart, or you may continue shopping. If you continue shopping, you will be transported back to the products page. NOTE: United States Postal Service First Class shipping within the U.S. is included in the quoted price. 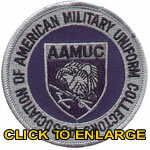 Show your pride as a collector and a member of the Association of American Military Uniform Collectors with this full color embroidered A.A.M.U.C. patch! It is easily sewn on to jackets, shirts, ball caps, or any other place you wish to use it! Size is approximately 3 inches in diameter. 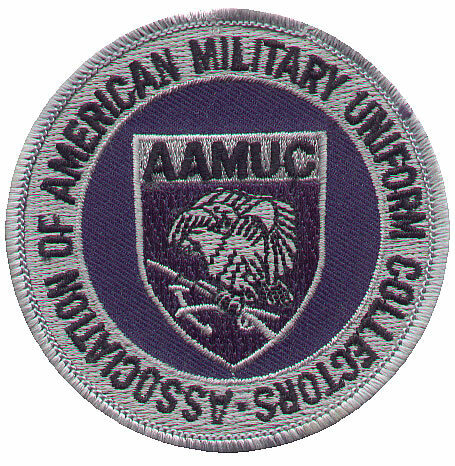 Show your pride as a collector and a member of the Association of American Military Uniform Collectors with this subdued embroidered A.A.M.U.C. patch! It is easily sewn on to jackets, shirts, ball caps, or any other place you wish to use it! Don't have a place where you can sew on a patch? No problem. You can still show your A.A.M.U.C. 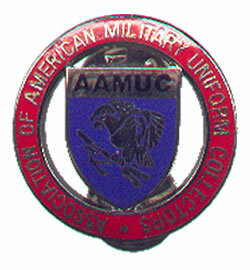 pride by wearing one of these beautiful A.A.M.U.C. 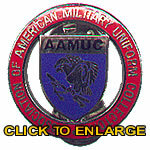 logo distinctive insignia (DI) pins. 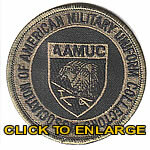 Goes perfect on a lapel, hat, tie, backpack, or any other location large enough to place a pin. The DI is a domed clutch back piece that is easy to see and easy to put in place. Size is approximately 1 1/8 inches in diameter. Each CD-rom should be able to be read by any standard CD-Rom player on your PC. So, don't let this opportunity pass you by! Not sure which volume has what? Just click the below link for appropriate Adobe PDF file to find a detailed list of topics or a grid showing types of articles. NOTE: The above indexes are provided in Adobe Acrobat (.pdf) format. Users must have Adobe Acrobat Reader installed in order to view. If you do not have Acrobat Reader, please click the below link for a free download of Acrobat Reader. Please be aware that by clicking the VIEW DETAILED CART link, you will be transported to another page with a produce-by-product display of your purchase. You are not automatically required to buy all or any items in your cart.